An international team of astronomers, including Professor Tom Marsh and Dr Danny Steeghs from the University of Warwick, have shown that the two stars in the binary HM Cancri definitely revolve around each other in a mere 5.4 minutes. This makes HM Cancri the binary star with by far the shortest known orbital period. It is also the smallest known binary. The binary system is no larger than 8 times the diameter of the Earth which is the equivalent of no more than a quarter of the distance from the Earth to the Moon. The binary system consists of two white dwarfs. These are the burnt- out cinders of stars such as our Sun, and contain a highly condensed form of helium, carbon and oxygen. The two white dwarfs in HM Cancri are so close together that mass is flowing from one star to the other. HM Cancri was first noticed as an X-ray source in 1999 showing a 5.4 minutes periodicity but for a long time it has remained unclear whether this period also indicated the actual orbital period of the system. It was so short that astronomers were reluctant to accept the possibility without solid proof. 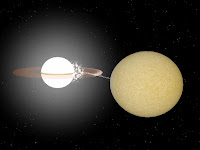 The team of astronomers, led by Dr Gijs Roelofs of the Harvard-Smithsonian Center of Astrophysics, and including Professor Tom Marsh and Dr Danny Steeghs at the University of Warwick in the UK, have now used the world's largest telescope, the Keck telescope on Hawaii, to prove that the 5.4 minute period is indeed the binary period of the system. This has been done by detecting the velocity variations in the spectral lines in the light of HM Cancri. These velocity variations are induced by the Doppler effect, caused by the orbital motion of the two stars revolving around each other. The Doppler effect causes the lines to periodically shift from blue to red and back. The observations of HM Cancri were an ultimate challenge due to the extremely short period that needed to be resolved and the faintness of the binary system. At a distance of close to 16,000 light years from Earth, the binary shines at a brightness no more than one millionth of the faintest stars visible to the naked eye. Dr Danny Steeghs of the University of Warwick, said " A few years ago we proposed that HM Cancri was indeed an interacting binary consisting of two white dwarfs and that the 5.4 minute period was the orbital period. It is very gratifying to see this model confirmed by our observations, especially since earlier attempts had been thwarted by bad weather." "This type of observations is really at the limit of what is currently possible. Not only does one need the biggest telescopes in the world, but they also have to be equipped with the best instruments available", explains Professor Paul Groot of the Radboud University Nijmegen in the Netherlands. "The binary HM Cancri is a real challenge for our understanding of stellar and binary evolution," adds Dr Gijs Nelemans of the Radboud University. "We know the system must have come from two normal stars that somehow spiralled together in two earlier episodes of mass transfer, but the physics of this process is very poorly known. The system is also a big opportunity for general relativity. It must be one of the most copious emitters of gravitational waves. These distortions of space-time we hope to detect directly with the future LISA satellite, and HM Cancri will be a cornerstone system for this mission."